Tonight on CBS Hawaii Five-0 continues with an all new Friday November 21, season 5 episode 8 called, “Ka Hana Malu (Inside Job)” and we have your weekly recap below. On tonight’s episode, Five-0 investigates a couple’s murder in which the victims’ sons are the prime suspects. Meanwhile, McGarrett is shocked when Aunt Deb returns to the island with her new fiancé. On the last episode,when McGarrett was kidnapped by Wo Fat, he experienced what would have happened to the team if they had taken a very different path, William Sadler returned as McGarrett’s father, and musician Gavin Rossdale guest starred as the nefarious Johnny Moreau. Did youwatch the last episode? If you missed it, we have a full and detailed recap right here for you. This is definitely one series that you don’t want to miss. Don’t forget to stay tuned to Celeb Dirty Laundry where we will be live blogging every episode of Hawaii Five-0 new season. While you wait for the recap, check out a sneak peek of tonight’s episode below! #H50 starts now with a red sports car zipping up a mountainous road as the sun sets. The driver almost hits a dog. They stop and try to find the owner based on the dog tag. The dog leads them barking into a fancy home. They find the owner of the dog murdered and the young girl screams in horror at the sight of all the blood. Steve greets his Aunt Deb with a hug (guest star Carol Burnett). She tells him she doesn’t know where his mother is before he asks. He then asks about her trip and she says she was worried because she didn’t if the chemo would be a problem but she says the sea air was just what she needed. She says her brain tumor has shrunk in half so it’s working. He says he’s glad she’s fighting the cancer and she says Leonard talked her into it. Leonard tells Stan he needs to file a lawsuit to get the money he’s owed then comes over to Deb. She introduces Steve to Leonard (guest star Frankie Valli). Leonard asks when she’s going to give him the news. She says Leonard proposed and she says yes. Steve asks what’s the rush and Deb says it’s romance. She reminds him of the song Live Like You’re Dying. She says she and Leonard both have cancer – they met at a cancer support group. She says they’re getting married tomorrow at six but Steve says Mary will be upset. Deb says his sister gave her blessing and it’s happening. Leonard pulls out a pile of cash to tip a guy to get their bags. Steve is a little impressed as he takes a call from Chin. He says he has to go and Deb says she’ll see him later. He and Leonard shake and Leonard slips Steve some cash. He gives the run down to Danny who says she should be happy. Leonard asks how a retired shop teacher can tip like a rapper. Steve also says the guy taught shop but his hands are smooth. He’s got Jerry looking into Leonard already. Maybe the guy is in Witness Protection?? Chin is at the scene and says the victims are David and Kate and they were shot while watching TV – shot a lot. Max is there and says this is literally overkill. David was shot in the back of the head, no defensive wounds. The woman was beside her husband. It looks like she turned and was shot in the chest. They were both shot from the lanai entrance and the shooter may have never even come inside. Steve asks where their kids are – they were at a sleep over. Travis and Jake come over and they ask about their dog Riley but they won’t let them in. They said they went to Tai’s house last night at nine and were there all night. Eugene, the family lawyer, shows up and says they can’t talk to the boys now. He tells the cops to call and make an appointment. Riley shows up growling and snarling and snaps at the boys. The cops wonder why the family dog is getting aggressive with the boys. Steve thinks the dog is trying to tell them something. At the station, Kono tells them the boys have no record and they didn’t buy a shot gun but Lou says a lot of people would have wanted David dead – 250 to be exact. They tell Steve that David was an investment banker and he pulled a pyramid scheme to try and cover his losses and lost a bunch of people all their money. He was facing prison and was going to be arrested in a month. Steve wonders if one of the victims of the fraud came after him. Turns out Tai, the kid they were with last night, is the kid of one of David’s victims. Tai’s mom gave all three boys an alibi for all night but Lou says kids know how to sneak out. They pulled traffic cam footage to double check. Deb and Leonard show up and Danny says he got to hear all about the cruise. Danny says Leonard has smooth hands and Leonard says Deb made him get a main pedi. They ask Steve to come to lunch but he says he’s on a case. He introduces Lou to Leonard and Deb asks him to their wedding. Lou says he wouldn’t miss it. He also has traffic cam news for Steve. 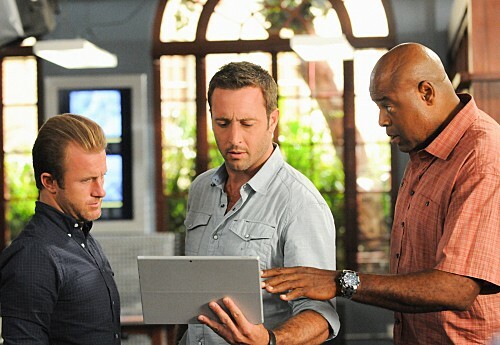 Lou shows them some footage of a car owned by Tai being driven around the time of the murder. Tai is on his scooter evading the police. Danny tells Lou to drive better. Then it turns into a foot race with parkour elements. The kid runs into the SUV and is knocked down. They arrest him for murder. He says he ran because he was involved in a weed sale and asks them not to tell his boss. Turns out he sells weed while he rents scooters. They tell him they are absolutely going to tell his boss. They ask if he’s mad about David losing his college fund and he says he’s not college material and his dad has plenty more money. He says he smoked a bowl and fell asleep at 11 and there’s no telling who had his car. He admits it could have been Jake and Travis. Tai’s mom thanks them for bringing him hone but reminds them it’s legal in Colorado. She admits she’s been lenient since the divorce. He says Jake and Travis may have taken the car and wonders who was in the car – because everyone is lying. She says David could be demanding and Jake and Travis needed a break sometimes. They ask about Kate and she says their mom was more sensitive. She says when they found out David lost Kai’s college fund, Kate showed up to apologize. She says Kate thought their whole life together felt like a lie. She says a month ago, Kate tried to OD on sleeping pills. She says she sobered her up and told her to be better for her kids. She says Kate was really close with the boys. She says Jake and Travis would never have hurt their mom like that. Steve gets a call from Jerry who says Leonard is actually a mob lawyer in hiding. He represented the Leone Family in New York and helped them beat murder raps. Jerry says the FBI think Leonard was involved in evidence tampering. Steve gets back to 50 HQ and Chin tells them David had a $10 million life insurance policy that would pay out to Jake and Travis. The government can’t touch that money and it had a double indemnity clause that makes the murder worth $20 million. Danny wants to scare the kids. Danny tells Chin about the dog going after the kids. They call the kids in and ask them to take a polygraph. Eugene tells them not to take it. They tell them they don’t know anything about the insurance policy. The boys tell them they’ll do the poly so the cops can move past them and find their parents’ killer. Danny and Steve step out and say Jake looks confident but Travis looked nervous. They wonder if Travis will try to get out of the test. Steve says he’s going to go tell his Aunt Deb about who Leonard really is. They separate the boys into private rooms and Travis immediately makes a call. He tells the person he talks to that there’s a problem. Jake takes his test first and says he didn’t take the car and didn’t kill his parents. At Kamekona’s food truck, he tries to feed Deb some shrimp casserole. Steve shows up. He agrees to take the food since Deb isn’t hungry but he gives it to someone else instead. Deb asks if Steve is okay and he tells her Leonard is lying to her about being a shop teacher. She says she knows and she was the one lying to him. She says she didn’t want Steve to not approve of her match. She says Leonard’s life as a mob lawyer is long over and tells him she can take care of herself. She says she thought she was going to have a singing career and it never happened, then she thought she might get married and have babies and that didn’t work out. She says the one thing she never gave up on was love and she finally found her true love at long last. She says she can leave the Earth knowing she experience the most profound thing a person can feel. She says she wishes the same for Steve and he says he did risk his heart. He says Catherine is still in Afghanistan. She says they went looking for a boy that was kidnapped by the Taliban so she decided to stay and try to protect the village kids. He says she’s teaching in a school there and it looks like she’s not coming back. He says Catherine told him not to wait for her. Deb tells him she’s fine and just needs him to walk her down the aisle at her wedding. He agrees. The lie detector tech says Jake passed the test. Eugene says he hopes that moves him out of the person of interest category. They go looking for Travis to take his test and the kid is gone. Chin says they were right – he says Travis slipped out and hopped a cab. Chin follows him with Kono. Travis goes to a hotel and Kono snaps some pics of him knocking at a door. The door opens and he goes inside. He tells the person that he can’t cover for them anymore. The cops bust in and cuff him and they find Tai’s mom in the bathroom. Uh-oh. Chin tells Travis he thanks Patti was hooking up with him and convinced him to kill his parents for the money. They ask why Travis ran and what he’s hiding. He says Patti and he took Tai’s car last night so they could be alone. Lou asks why and she says Travis wanted to tell his parents about them. Travis says if Patti’s ex found out they were sleeping together, he’d take custody of her daughter away. Travis says he loves Patti and says if he had gone to tell his parents, they might still be alive now. Looks like the kid didn’t do it. Chin and Kono seem convinced. He hangs his head and cried. Kono tells Steve he seems sincere. Chin says they still don’t have an alibi so they can’t rule them out yet. Steve sees the lawyer show up and they wonder if he might have been in on it since he’s the executor of the $20 million estate that he’ll get a piece of. Steve says they need to dig into Eugene’s life. Steve heads over to the court house to meet Leonard. He tells Steve he worked for the Leones but he says he was protecting them from government over-reach. He says everyone has the same rights to be protected. He says he gave him his best defense. Steve asks if he buried evidence and Leonard pulls out a box. He says there was a key delivered to him that was to a locker with a note to destroy it. Leonard says he never opened or destroyed the box. He hands the box to Steve and tells him to do what he thinks is right. Leonard tells him that in a month or so, he’s going to take a turn for the worst and then he’ll be gone. He says he just wants to spend the little time he has left making Deb happy. He thanks Steve for hearing him out and says he hopes he’s at the wedding like Deb wants. Steve and Danny look at the box. Danny wants to open it. Steve says if it’s a murder weapon, he has to give it to the New York DA. Danny says that could cut Leonard’s honeymoon short. Lou knocks on the door and calls them out. He says Eugene had an alibi and they wonder if he hired it out. Lou says there is nothing in his finances to indicate a payout. He shows them there are no withdrawals or wire transfers. Danny says he may not have paid out of his own account. Chin shows them an account under Kate’s name that Eugene had power of attorney over. Chin says he saw a wire transfer for $100k to Greg Barber – a guy with ties to organized crime. They go to Greg Barber’s place, but he sees them coming and opens fire on them with an automatic weapon. They return fire as they hide behind a car. Steve tells Lou and Danny to cover him and he takes off running for the building. They lay down suppressive fire and he jumps into the apartment and tells the guy to drop it. He doesn’t, so he has to shoot him. They didn’t find the murder weapon in his place or car but Lou found photos of the victims’ house on his laptop. Someone emailed them to him – turns out it was Kate that sent then. Travis and Jake are floored that their mom hired someone to kill them both. Steve says they think their mom did it so they could get the $20 million and a fresh start. Travis is floored and Steve says their mom drugged Riley so he would sleep through the murders and was emailing with the killer. Steve tells the boys he’s sorry. Travis says that’s why the dog was freaked out this morning. Jake asks how his mom could think they would want the money more than them. Travis says their parents were always too involved with money. Danny says the insurance company might not pay out but Eugene says since David and the boys didn’t know, they should still pay. Travis says he would want the people his dad cheated to have the money. Steve tells Travis he’s sorry he misjudged him and tells the boys he’s sorry for their loss. Later, Steve and Danny are dressed for the wedding and are back to staring at the box. Steve says he’s going to put it into a locker and forget about it for a couple of months then find it and send it to the DA in NYC. Lou shows up dressed up. Steve says if Leonard loves his aunt, that’s enough for him. The guys head out to the wedding. In Waikiki, the small wedding is lovely. Steve tells Deb there is her last chance to make a run for it. She says no way and he walks her down the aisle. She and Leonard are married. Leonard calls her his angel and says he’ll cherish every moment they have together. She sings a Gershwin song to him in lieu of writing vows. It’s lovely and they are officially man and wife.